I love, love, love this photo. 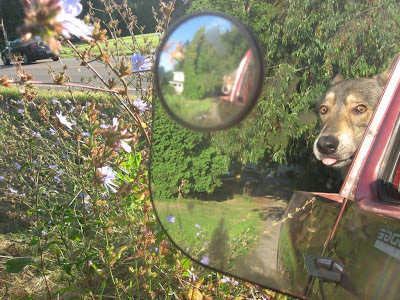 hehe This is actually a photo of the side mirror on my dad's truck, and, of course, Matouk is in the back. Don't ask me why I'm so crazy about this photo, but as soon as I saw it, I immediately loved it. Please forgive me for the lack of sign-in on last week's CC, and also please forgive me for posting CC late today. Honestly, I didn't realize that it was even Saturday. My schedule is way out of whack. After getting home from shopping with my aunt, I opened my e-mail and Tammy reminded me that it was Saturday and I hadn't opened Camera-Critters. If y'all haven't given up on me yet, I promise next weekend will be back to normal. Maybe you love it because it is so darn cute with his tongue hanging out ever so slightly. How could anyone not love this picture. It is priceless. Nice shot of Matouk. But you know me...I was looking for bugs on the flowers...hehehe. What a cool picture! I miss you and can't wait till you're back!!! Welcome to the club. I can't keep track of the time either. I like how you used two mirrors to good effect in the photograph. What an adorable picture!! I'm confused on my days too!! I'm glad the weekend is here though! I've been caught with my head hanging out the truck window just like a dog...but at least my tongue wasn't hanging out. I love this photo, too! Well, it is an adorable photo! Interesting reflections, Matouk with a funny teasing expression :-) Do you use this one as wallpaper on your desktop ? This shot is just wonderful! So many mini pictures blending together! And the slight tongue hanging out add that extra bit of smiley charm! LOL.. you love it because Matouk is sticking his tongue out and saying "neener neener neeeeener, I'm in the truck and you're nooooot"
That is beautiful picture and I love it too! It took me a second to figure out that picture. Very cool! That's an amazing shot. Priceless! The tongue just makes the shot! I missed Camera Critters completely this last weekend. It wasn't so easy getting online at my mom & dad's house - and then we spent all day Sunday coming home. I didn't make the rounds last Saturday, so I'm trying to get around more today. Cute photo! It kind of plays with you, the photo of a mirror within a mirror or something.